We drove back to Kunming in the afternoon & checked in at the Golden Dragon hotel. That night Tony took us out for a local favourite meal: the Mushroom Hotpot. The restaurant was above a department store for silk products. 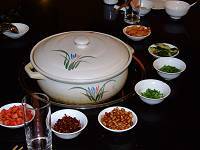 The dishes consist of 4 different types of local wild mushrooms, some other vegetable dishes plus fish balls & pork. All need to be cooked in the hotpot of superb chicken stock. It was lovely. 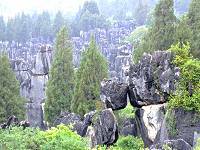 Next morning we visited Shilin, 120km southeast of Kunming, for its famous Stone Forest. 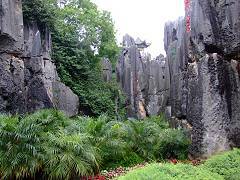 Like the 3,000 spectacular limestone islands of Ha Long Bay in Vietnam & limestone hills along the Li River in Guilin, the limestone in Shilin are resting among a forest of trees & parkland. This grey limestone is in many different sizes. Some are as tall as 30m high, some are like small mountains, some are big rocks etc. 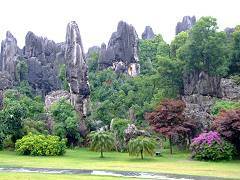 Among the grey pinnacles & peaks there are ponds, walkways & pavilions etc in the forest. Although it was grey & rainy that day it was very enjoyable to walk around. 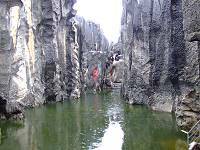 This trip is also very popular with the local Chinese tourists in groups. We will be touring our client in the forest by the western route that is quieter way to explore this fantastic parkland. One more thing is famous in Shilin, the local dish of Yiliang duck. The duck is sweetend with honey and cooked over smouldering pine needles. The meat is tender & delicious. This is very different to the famous Beijing duck. All along the road to & from Stone Forest there are stalls that hang their ducks out to tempt you into their restaurant. We tried it & it was the best duck dish that we had for a long time. It was so good that Tony ordered another half duck after we had already eaten a whole duck between four of us. I would say that if you had not tried the Yiliang duck you have not been to Shilin. We arrived back to Kunming & visited the 5* Green Lake hotel. This is the best 5* hotel in Kunming by the Green Lake. The hotel is a modern and elegant in 5* international standard. The grand entrance to the hotel is via a semicircular drive lined with palm trees. We are using the Green Lake as our deluxe hotel choice in Kunming. That night Tony took us out for a seafood dinner. 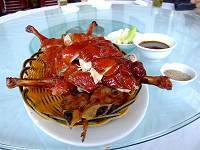 Good though it was, it could not eclipse the memory of the Yiliang duck. Next day we left Kunming to UK. Many of you may have already visited Beijing, Shanghai & Xian but if you want to see the rural beauty of China with its magnificent mountains in Tibet & Shangri-La, the ancient towns of Dali & Lijiang, the magical beauty of Black Dragon Pool Park & the Yiliang duck this is the tour for you. We offer our 12-day Mountain Kingdoms tour, which includes Tibet, Shangri-La, Lijiang and Dali, but like all our tours it can be adjusted to suit your requirements. I hope you enjoyed reading my story and 1 look forward to hearing from you soon.